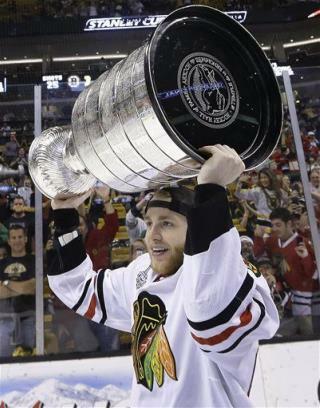 (Newser) – The Chicago Blackhawks may have crushed the hearts of Boston Bruins fans when they won the Stanley Cup, but they definitely don't want any hard feelings. The team took out a full-page ad in the Boston Globe today thanking the city for its hospitality. "As impressed as we were by … the Boston Bruins on the ice, we were deeply touched by what happened off the ice," the ad reads. "Rarely have we experienced the hospitality you afforded us throughout the playoff series." Blackhawks have become a classy, successful organization ever since old man Wirtz died and left the show to his kids. Wow! That's some incredible sportsmanship! This one shouldn't be forgotten. Now: IF ONLY the Chicago Cubs could win a W.Series..! That woud be a Miracle! !